The title is as posted on the site but it is misleading. More appropriately it should be "Windows 10 to allow the Secure Boot alt-OS lock out [to be] a reality". So if Dell, or Lenovo, or whoever wants to sell a PC with Win10 then they can do that and lock you out from ever booting anything "not-approved" by MS.
All of you writing hobby OSes will have a hard time getting MS to sign your binaries. While you can probably avoid buying a locked PC for your own use you can't control how others will buy theirs, so any non-mainstream OS will likely see a lot of incompatibility problems. Not a problem since most people who buy a PC with Windows pre-installed do not want to know about other OS, especially free (as in free beer and freedom). Why!? Just look at the prices, Windows is more expensive because they have to pay "interests" to Microsoft while Linux is usually very cheap, if not free (as in free beer). That is why a lot of people in my country buy PCs with Linux pre-installed and then install a pirated Windows version as soon as they get to their homes. It is important to mention Windows costs about three times more than it costs in USA (the same applies to all imported products). All of you writing hobby OSes will have a hard time getting MS to sign your binaries. That should be a joke. Unfortunately, it is not. While you can probably avoid buying a locked PC for your own use you can't control how others will buy theirs, so any non-mainstream OS will likely see a lot of incompatibility problems. I am quite sure there will be hardware vendors that will not implement this crap on their hardware (specially for the "Do-It-Yourself" market), if they do then there will be an option to disable it completely. And in my opinion, those who attempt to sell things so restrictive will see their sales dropping like a rock in the vacuum (Windows/Microsoft, I am looking at you). Boycott to such products will surely occur, people do not like. Note that the only change is that Win8 had a requirement that the user can disable secure boot. But now with Win10 that requirement has been removed so OEMs can lock you into Windows if they wish to. It remains to be seem what the majority of consumers really want or care about. There is a lot of FUD going around that tells people that nasty malware can't run if you have secure boot. So perhaps many people will want to be locked in? Perhaps business customers will be happy to prevent their employees from booting alt-OSes from a USB stick? So perhaps many people will want to be locked in? If you buy a PC from Dell/HP/Acer/etc you aren't someone who cares about any other OS anyway. From what I've seen in my job, people go to their nearest big store and buy a computer, not an OS. From what I've seen in my job, people go to their nearest big store and buy a computer, not an OS. I'm not quite sure what you mean there. A computer without an OS is pretty useless. People will also need to know that the computer they buy can run the applications they use. They probably wouldn't buy a PC with Linux on it if they run Windows only apps. A computer without an OS is pretty useless. For most people: A computer without a non-free OS is pretty useless. They probably wouldn't buy a PC with Linux on it if they run Windows only apps. Thanks to this famous phrase: "If it is free then it is not worth". Most people think free (as in free beer and/or in freedom) software is always inferior to paid and/or proprietary alternatives which is not (always) true (see LibreOffice). The result: Billions of people are dependent on an OS they cannot change or know what is in there (from intentional backdoor to harmless bugs). And as Windows does not deserve the place it currently is, its users suffers from malicious program that run even without their consent thanks to its very not secure design. There are people who say: "It is because Windows gives you support". OK, but there are many companies which will offer you support for your Linux issues for a fraction of what Microsoft charges and requires of you (see their stupid EULA rules... You cannot tell it is better, +I bet you disrespect their rules everyday without even knowing. That is because their rules are so restrictive that you will (probably) not be a human if you follow them all). It is not hard to hear people saying: "If Windows ceases to exist, the world would end D:". I can tell you, if it does then it will just be a mere coincidence as the world can easily live without it. Windows is just a bad software which succeeded because of that famous phrase (+dirty contracts). Interesting thought. A lot of businesses are scared of all the effort needed to get Linux running in their offices. Those efforts needed are a combination of many things like testing apps for compatibility, training users, deployment, PC purchase chain, etc. For gamers it seems to be almost a no-brainer, Windows or nothing from what I can tell in the general Internet discussions. To boot, most games (way more than 1000) are Mac compatible. But the biggest impediment to Mac gaming is the fact that a computer with gaming-level hardware costs $2000+ if you want it to come with an Apple logo. My grandparents, and lots of my friends are not computer wizards. What matters most by them of course are the applications, not the OS itself. As long as they can handle the office documents, do web browsing, watch videos etc then it's fine. They are not computer geeks who are obsessed with building the latest kernel every day. Windows... or gaming console like Playstation/Xbox. Usually, game publishers release the console version first. Then after like a year, they'll release the PC (Windows) version. Now, thanks to Steam, gaming on Linux is pretty favourable. But then again, most big boys like EA, Square Enix, Activision, Bethesda etc haven't shown an interest on supporting Linux. Most tend to think: "If it is free then it is crap" or "If it is free then it cannot be better than MAC or Windows, which are both paid and developed by big companies". It is as simple as that, ignorance in its purest form. Linux will fit their purposes nicely. That is what I did in my home. Now everyone uses Linux with no problems and they all do the things you said. There are no geeks in my house and we all use Linux. And I have never compiled any Linux kernel yet. Those are harder because they follow the money. They will only show up when the Linux market is promising enough to justify their investments (this of course, if they break their dirty contracts with Microsoft and other companies, which is harder than most can imagine). Well, most people use Windows because they are already familliar with it. Some other, who can afford Mac system, will use OSX. This is regardless whether they belittle free OSes or not. I bet the first OS most of them had contact with was Windows. That is why it is so hard for them to change, change requires work and headache (as well as learning, but changing is even harder as you will move back to your comfort zone). If it was otherwise, they would be very happy Linux users and if you tell them you cannot change anything on Windows without getting sued or taken to the nearest prison, they will refuse the change immediately. Well, it depends on location. In my country, most people who use Windows or MAC tends to refuse free OS alternatives without even knowing them first. Not to mention the myths they spread about Linux. That is true. As an example, I stopped using Windows myself completely this year when I uninstalled it from my hard drive (it was not much used anymore either). But games are still a problem that forces 99% of people who enjoy games to use Windows. I was one of them, but then I decided to boycott games that were not available (natively) for Linux. That is the problem with proprietary software. You do not have choice, you do not have freedom. All you have is an EULA that tells you can go to jail if it is not respected. Did not like the latest changes applied to the software? Bad luck because you will not be able to change, so accept it the way it is. For open source software, if I am not happy with a program's behavior I can easily change the source and recompile. That makes users happy, and happy users are most likely to donate ($$) and/or buy software. Non-disable-able telemetry, auto-backing-up personal details to MS servers, bitlocker keys auto-backed-up to MS servers, unique advertising key so everyone can track you, sending keystrokes to MS servers, etc. revolution, the average users do not care about that. Windows 10 will be a success. 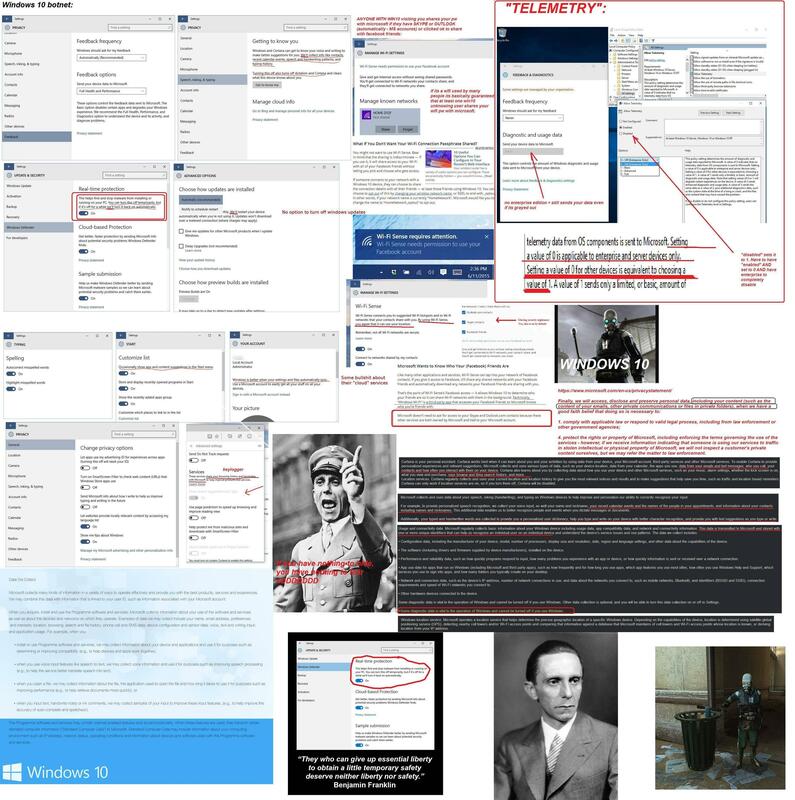 Microsoft will always spy on you. They are just making this clearer this time. I think fighting against this is a waste of time as no one can prove easily if Microsoft is spying or not, their software is closed and their EULA forbids you to investigate that. The only way is to use an OS you can analyze and investigate. And there is also the problem of things built into the hardware we buy... Well, at least you can make sure the OS is free of loggers. I don't accept that things are not worth fighting simply because others can't be bothered to care until it is too late. I do accept that Windows 10 will be a success because it is "free", and so many people seem only to think as far as their nose and never look beyond. But I will be researching alternatives like Linux and BSD with an eye towards finding a way to run the Windows applications within some emulator or VM or something. So far I've never had any success with running Linux in any of my current machines; perhaps BSD, or the latest hardware, will give me more success. please try porteus linux, fyi, i been using it for months, with my diskless laptop, everything boot into memory and proceed from there. i am quite sure you will love it, the concept is simple and package can be zip from slackware and etc distros. I've been trying to reduce my windows dependence for a while but still stuck on too many windows-only games/applications, including some work-related. Luckily some of the older ones now [only] run nicely under VMs, so there's a glimmer of hope that one day I'll succeed. well for me, the strongest part, easy customization, and boot cheat codes.